If you have your own blog or website, and you occasionally do a blog post about Filofax, tell us about it. Post the address of your blog/website in the comments of this post. I'm sure others would love to read your blogs. Spotted today on the Filofax Twitter feed. They have reduced the price of the Beauty Gift Box to £35. It's only available on line from the UK site though... We thought it represented good value at £40 but at £35 it's even better. Available in three styles... Take a look on the site for full details. Over the last week or so we have seen some great tips on organising your diary entries and how to make best use of your chosen format/pages etc. I would like to ask, does any one have any hints and tips on organising your contact information in your Filofax? Let's hear your ideas, or tell us about anything Filofax related. If you click through to the Filofax UK site using this advert and then purchase something on the Filofax UK site, I will be receiving a small commission. This commission will be put towards the small cost of running the site and will be ploughed back in to the development of the site, it will also be used to pay for postage to deliver future prizes etc. Whilst the commission is only earned on the UK site, any future prizes will be available to any reader no matter where you are in the world. At present the prizes have been donated to me by Filofax UK purely because I live in UK. I am not aiming to make a profit from the commission it will all be used towards giving something back to you the readers in some shape or other. I will also promise not to make the advertising too brazen and 'in your face' so it detracts from your enjoyment of reading and commenting on the blog posts. Additionally you will only ever see adverts for Filofax on this site. So if you are thinking of purchasing anything from Filofax UK, please click through to the site using the advert link in the side bar. Wouldn't it be so much easier if we had one currency for the whole world! So some background information if you wonder where this is going... Amateur radio has been around since the late 1800's and today there are approximately 6 million licensed radio amateurs in the world, with about a million of them in the US and at least 70,000 in UK. So it is a true worldwide hobby. Each radio amateur is issued with a unique callsign which is based on the geographic location where they live. In my case I was licensed as G8SFR back in 1979. Radio amateurs love to collect information so they have it at their finger tips when they are 'operating on air' and to me a Filofax would seem a great way of keeping that information together in one place, especially if you are travelling around. I have already created an amateur radio log book page which you can download and print out from DiY Planner. But I'm sure there is scope for other specialised radio pages. I'm planning on putting together a specialist organiser for my radio hobby, some existing Filofax pages can just used as they are such as the world maps, timezone maps, notes pages, contact pages (useful for noting names and locations as well as callsigns etc). So this is just a brief insight in to one of my other hobbies (I have too many!) I would love to hear from other radio amateurs, and anyone else who uses their Filofax for their own hobby, however unusual. Poll - What size Filofax Organisers do you own? Running in parallel with Laurie's excellent 'Roll Call' post, I've just added a poll to gather the votes on what sizes of organisers people own. This vote will allow to vote for multiple entries. I will let you decide which ones to leave out if you don't often use a particular size any more. If you aren't sure what sizes they are, check out my earlier post on Filofax Sizes. 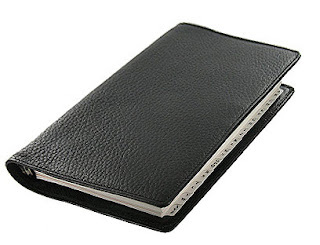 The size is also embossed on the inside cover of your organiser. Please carry on commenting on the 'Roll Call' but don't let us stop you adding comments here too. The result will be published at the end of the poll as usual. Roll Call: What's Your Format? 2) Are you planning to stay with the same format for 2010? Me first! I’m Laurie. After much flitting about and numerous episodes of Calling the Dog, I have finally settled on the original, basic Personal size week on two pages, unlined. After all the millions of planner formats I’ve tried over the last few years, I am absolutely shocked that this basic format is turning out to work the best for me. I guess there is a reason why it’s so popular! Do I plan to stick with it for 2010? Well, I have very good intentions. I have filled out all the holidays, birthdays, and other events in my 2010 pages. But I will be the first to admit, if I actually stay with it for the entire year it’ll be a miracle. From January to October 2009, I used 12 different formats/ sizes/ planner books in my search for what works best! And frankly, I’m tired of tweaking so let’s hope I have found my solution. How green is your Filofax? So as usual a quick dive in to Google pulled up a few sites that were relevant to this discussion. The first obvious search result was Filofax's own Environmental Policy which mentions all the things you might expect for a large company. I will let you read it for yourself rather than copying it in to this post. I also came across a blog post at Green Girls Global who where saying that they had tried to buy recycled Filofax inserts but Filofax no longer supplied this type of paper. However, when you look back at their policy they do obtain their paper from mills that obtain pulp from sustainable sources. Also Filofax is a premium product, I'm not sure off-white paper would have quite the same appeal over time as ordinary paper. I have some inserts from 20 years ago and they are only slightly off-white (aged) now. You can even buy organisers made from recycled printed circuit boards. I'm an radio engineer but these don't really appeal to me for my organiser. I do prefer more natural materials, circuit boards are made from fibre glass, so they will be a bit 'scratchy' and rough around the edges. Your Filofax doesn't as far as I know contain any batteries that need special treatment when it's time to dispose of them. It doesn't require chargers or electricity to run it. It doesn't contain precious metals... precious memories may be! Whilst the production of the organiser might involve certain chemical processes to treat and dye the leather. Given the life span of most organisers and averaging out the impact of your organiser on the planet, it's fairly low impact really. How many mobile phones or electronic organisers will still be functioning and still look as good in 20 years time? Also how many products can you still buy 'inserts' or parts for them 20 or more years later? Unlike conventional diaries you are also only replacing the pages you actually need to replace each year, this has always been one of the great attractions for me about a Filofax, no need to transfer all my contacts, birthdays, and other reference information across to another new diary each year.You also have the ability to customise the contents to your exact requirements. From the posts and comments, a lot of us store pages for later use/reference. I do this with my diary sections. But to-do lists and other consumable pages I recycle or shred, so I'm being fairly green in that respect I suppose. So all in all I think you can congratulate yourself in using a fairly green solution to planning and organising your life. For all of you who can order from the Filofax US website, I have a promotional code that will get you 25 % off all paper, accessories and pens (not diary inserts or, sadly, organizers though) through October 31. It is: X25. Happy shopping! 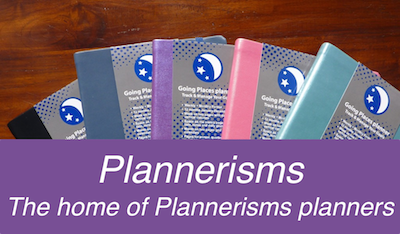 Also not to be missed is NH Grrl's blog post about her newest Filofax acquisitions, featuring 2 new slimlines! Go and post a comment! It's a very exciting Filofax day! What's new in your Filofax life these days? Philofaxy now has a 'fan' page on Facebook why not become a fan. Like our Twitterfeed we will publish announcements about new articles on Philofaxy. But you will also be able to have discussions and upload photos as well. As with all of these social media things it might take us a little while to find the right settings/balance. But don't fear we aren't diluting our attention away from the blog, just spreading the word around in to more areas. Seems like there are a million movies with a variation on this theme: Person and dog love each other. Dog somehow gets separated from person and lost. New person finds and adopts dog. New person and dog love each other. Then one day, Original Person finds dog, and the argument ensues with New Person over whose dog it is. He was my dog first, he’s my dog now, etc. So to solve the problem, they let the dog decide. Both people stand far apart with the dog between them. Then they both call the dog at the same time. Whichever person the dog goes to, gets to keep him. I do a variation of this when I am trying to decide which planner/ diary format will work best for me. I often find myself trying out a new format or size to see if it will work better than what I am using. The way I decide between two formats or sizes is: I fill out my entire week in both formats/ sizes with my appointments, tasks, special events and everything else for the whole week. For example, if I am having a really busy time, I fill out the week in my A5, and also in my Personal size to see if I can figure out techniques to make my Personal work well enough when I am very busy, or if I have to have the larger page size of the A5 to write everything in. During the course of the week, I pay attention to which one I look at and use more. The one that works better for me at the time is the one I either switch to or stay with. Usually the winner is apparent after just a few days. I’ve just now realized that it’s my planners calling me, and whichever one I go to gets to “keep” me. Which means I’M the dog!! Maybe I should come up with a different name for this! Does anyone else “call the dog” and use two planner/diary formats at the same time to see which works better? Michele had a question in her comment on my Where Did I Read This? post asking how people use separate Filofaxes for work vs personal use. For those of you who do this, can you please give us details on how you decide what information goes into which Filofax, is there any/ very much overlap (information that goes into BOTH the work and personal use Filofaxes), and perhaps most importantly, do you use separate diaries/ planners for work and personal use? If you do, how to you manage both calendars and avoid scheduling conflicts (such as scheduling a doctor or dentist appointment at the same time as a work meeting, because your work Filo is at work and you only have your personal one with you)? What are some difficulties you have discovered with having two operating Filofaxes, and how do you get around these? And also, how does having separate work vs personal Filos make things easier to manage? Or, have you tried this method and found it just didn't work for you, you have to have everything in one book? I've been doing some research this morning in to the paper sizes for the different formats of Filofax Organisers. I think we are all familiar with the current ranges available. They are detailed on the Filofax sites. But there were a few exceptions that I wasn't certain about mainly the Deskfax and the M2. I also came across the Pocket Slimline, same size as the Pocket, but I presume it has smaller rings. Likewise how does the Compact differ to the Slimline? Same paper size but I guess slightly different ring size. I can only assume that some of these lesser known sizes are no longer sold because of the lack of sales. Although inserts are still available for them. They are all 'portrait' format with the exception of the M2 which is 'landscape' format. To see inserts for all of the formats, the best site I found was City Organiser here in London. 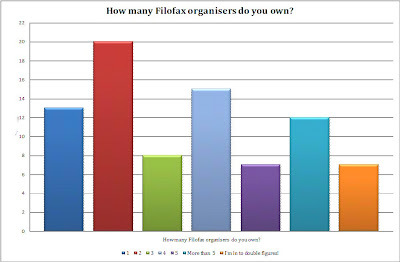 Poll result - How many Filofax organisers do you own? Thank you everyone for voting in our latest poll, an even bigger vote than our first poll a few weeks ago. So amongst Philofaxy readers, just having one Filofax organiser is not enough. What is surprising it seems that having an even number organisers is more popular. It wasn't surprising that more people use two organisers, just based on the comments and articles we have seen. Look out for the next poll in the next week or so. Thank you to everyone who took part. Do you know any famous people or celebs that are Filofax users? I was triggered by the 'Filofax sightings' post. I don't know of any one specific... but I can imagine a few likely candidates... may be Sheryl Crow the singer for writing down her wonderful lyrics for songs as they come in to her head. Who do you think is or might have been a Filofax user? It's growing a little cold in some places. Do you use your Filofax to help deal with the change in climate -- when to flush your boiler or swap your winter clothes? I'm using mine to schedule an appointment to have the boiler serviced...otherwise, it's getting pretty cold around here! 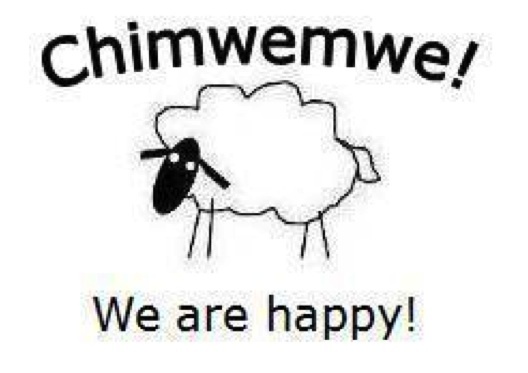 Where did I read this??? Hey everybody, I need your help. Somewhere I read a great Filofax story and now I can't find it anywhere!! I've searched on this blog, but didn't find it. I hoped I had saved a copy on my computer but I didn't. Here's the story: someone wrote this story about the coolest Filofax they had ever seen. It was a personal size Ostrich one owned by an elderly lady that had been using it forever and she had NEVER taken anything out of it. It was scuffed and stretched, but she would never give it up. The author of this story said he/ she was desperate to look in it but the owner wouldn't let anyone touch it. Some time later the author of this story heard that the lady had passed away and all they could think was, "What happened to her Filofax???" WHERE did I read this story?? Has anyone else seen this online somewhere? It's such a great story, I want to save it. I can only imagine that Filofax and what might have been in it!!! Tell us your Filofax sightings! It's my birthday! Yay! Happy birthday to me. Just for fun, let's talk about Filofax sightings. I mean, not just Filos in the store but real live Filofaxes in use by a person. Ideally these would be in real life, but television and movie ones are good too. Yesterday I met a group of doctors who are in town working on a new medical program. One of the docs had a black personal Domino that I was dying to grab and look through! But I restrained myself (barely!). I also wanted to say, "Hey, I have one of those in grape, isn't it great? Let's talk Filofaxes!" But he had more important things to do than chat with me about Filos so away I went. What Filofaxes have you seen out and about lately? Do you work with someone who uses a Filofax? Have you had the rare opportunity to see a Filofax being used out in public? I think there should be Filofax coffee houses where only Filofax users can enter, so we can sit around and drink coffee and look at each others' Filofaxes. Even better, have you seen someone using a Filofax and then TALKED to them about their Filofax?? I would love to hear from the brave reader who has done this! So let's hear about your Filofax sightings! It seems being creative and using a Filofax seem to go together. Nan recently highlighted Sara's Creations. fILOFAX blog and then look at the Duplex page, sorry I'm not sure what language the site is in, but there are some interesting insights to old products there. New Poll - How many Filofax organisers do you own? We will publish the results at the end of the poll next week. We will run another in the future to find out the most popular size/style of Filofax. 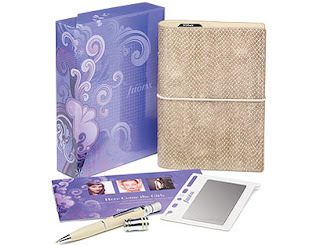 Thank you all for your entries and again thank you to Filofax UK for their support and sponsorship of this gift box. It suddenly occurred to me that a slimline might make a good combine diary/wallet. I currently carry quite a small wallet but like most of these things I have been carrying too many cards in it. So it too needed to go on a diet! So I ordered a Finsbury Slimline organiser and benefited from a discount code for completing a survey on the Filofax website. It arrived today and the rings are tiny compared to anything else I have, but it takes a diary refill ok (it came with 2009 and 2010) I'm going to put October 2009-December 2009 in as well. But I will be carefully planning the rest of this organiser to keep it slim. There's no closing clasp to hold it close which will be a first for me, there is a pen loop though. The leather is very supple though, no stiffness in the cover so in a suit or jacket pocket it will not be too obvious, which is why I bought it really. Being personal size I can see this slimline organiser possibly becoming my normal carry around organiser in place of my compact pocket Finsbury... time will tell. 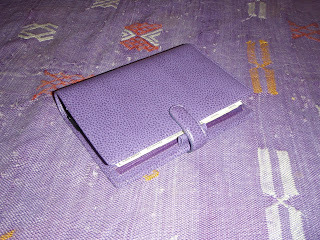 My dad very generously sent my birthday present, my newest Filofax: a purple personal size Finsbury! I'm so excited!!! Purple is my favorite color, and I already have a purple A5 Finsbury (which I use as my household binder) so I'm extremely excited to get the personal size in purple too. A matching set! I'm already using it, and it's just wonderful. It doesn't lay flat yet but I think it will in no time. The leather is pretty flexible and I don't think it will require any extreme measures to get it to stay at least mostly flat when open. Check out my pictures on my Flickr photostream! So we are approaching the middle of October, the leaves are changing rapidly here in UK. My friends in France are still boasting about how warm it is with them. So are any of our readers approaching their Spring yet? One last request from me... tomorrow is the last chance to enter the Filofax Gift Box draw, the winner will be decided tomorrow afternoon (UK time). We see quite a few questions in the comments that we the Philofaxy team are not always able to answer. We are users as much as the rest of you. So when we were contacted by Jessica from Filofax UK recently, I thought what an ideal way of getting some of the questions answered and also getting more of an insight in to how Filofax as a company see their 'brand' and product line. So we are grateful to Jessica for the time that she took to answer the questions. Q1. What Filofax organiser do you use most? A1. I have a Finchley personal in teal with City Dweller pack as my main planner, an A5 Siena for work notes and meetings and a mini Finsbury with a tube map in the back that is INVALUABLE when up in London. Q2. Where do the designers get their ideas/inspiration from for new products? A2. Our head designer takes cues from many different sources. She keeps a keen eye on trend forecasting to see what will be big each year. There is actually an archive of past designs as not all of the team's creations make it to retail! Q3. 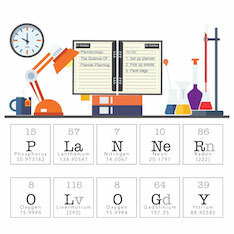 Our readers are always asking, but how can you get your organiser to lay flat on a desk? A3. We find that most A5s do! With time also, the leather tends to become more supple and will lie flatter. Q4. We are seeing more and more people returning to Filofax after trying electronic solutions. What are Filofax doing to attract new younger customers? A4. Every year we carry out market research on this topic , monitoring the different organiser solutions on the market. What we are seeing is that many consumers use both a Filofax and a smartphone (like me!). For this reason our approach is to embrace technological solutions and have lots of things in the pipeline, so watch this space! As for the younger customers... the last few years have seen a variety of different colours and designs that we've found to be attractive to the younger demographic. There will be more of this in 2010. Q5. Why are there differences between the UK and US on-line stores? A5. There are 7 Filofax subsidiaries globally and each is responsible for their own on-line marketing/ product choice etc, though we all work from the same platform. The main difference is in the range choices - US takes the 'Lizard' and 'Ostrich' designs that we don't here in the UK. Q6. Why has Filofax discontinued so many old page designs? A6. This is mainly a retail issue - stores have not had the space to stock all of the different types of refill which may not appeal to more than a handful of customers. However, the growth in on-line is providing the opportunity to restock these. Another 'watch this space'. Q7. How can customers suggest ideas for new pages? A7. We would LOVE to hear from customers about this or any suggestion! You can contact us through our site or on Twitter (Filofax_UK). We think it's great how people want to talk to us through Twitter and we really value all the feedback we get - good and bad! Q8. How do you market differently in the UK vs the US? A8. The central marketing department creates all the collateral and guidelines for each subsidiary to execute for their own region. Q9. Is your customer demographic similar in each(UK & US), or do you find that your customer base is significantly different in one compared to the other? A9. The two are fairly similar - female biased with a core group of users in the 25-45 range. The US is stronger in the student market with their 'back to school' campaign always doing very well. Q10. How do you recommend we take care of the leather to make it last longer? Leather is a natural material and there may sometimes be textural or shading variations within the surface. These are natural characteristics and representative of the leather’s unique individual beauty and proof of its genuine origin. It is recommended, however, that you avoid exposing your organiser to harsh elements such as moisture, bright light or direct heat. In the event that a Filofax organiser becomes soiled, the following care guidelines may be helpful. Smooth, porous leather can be treated with good quality, neutral coloured leather cream (subject to manufacturers instructions). Fabrics can generally be cleaned by using a damp cloth. Q11. Do you repair organizers if the rings break? A11. Yes we do if they are faulty. We also issue a guarantee with each organiser but we are aware that it needs some work! Q12. Can you share some Filofax stories that you've heard over the years, like the legendary one about a soldier's Filofax stopping a bullet? A12. The best stories we've heard are perhaps not as dramatic as that!! We really enjoy hearing the stories about how someone's Filofax has changed their life - helped them to be more organised or achieve something they'd always wanted to do. People contact us a lot with this kind of story and it may sound saccharine but we all firmly believe the 'It's a way of life' motto, and so often this is reaffirmed by the customer response we get. Q13. Has any one had a lost Filofax returned after decades? A13. I haven't heard this story but we do offer a personal organiser registration service that would help! Q14. Will Filofax organisers ever be Made in England again? A14. Not for the foreseeable future but never say never.... the quality is exceptional with our current supplier which is a hugely important factor for the Filofax brand. Q15. Which size/style of organiser is the best selling at the moment? A15. The Finsbury personal, especially Raspberry, seems to be a favourite at the moment. Thank you Jessica and the team at Filofax UK for answering all of those questions. Please comment if you have any follow on questions. Is it time to put your Filofax on a diet? OK own up who is guilty of trying to put too many pages in their Filofax organiser? It's ok you don't have to hang your head in shame, I'm sure we all do it, including me. So I had a session the other day of going through each of my organisers and decided on which pages should stay in and which ones would go in to storage. My A5 was the worst, I had a A5 booklet print of my Canon EOS 20D manual in there. It had been left in there from our long summer holiday in France. I prefer to carry a copy and leave the original manual safe at home, but at 168 pages at 4 pages per sheet... yes guilty as charged! So that came out straight away! On my Pocket Finsbury, I took out the first nine months of this year in the diary section and stored that. I will refer back to the pages in a couple of months time when I do our family Christmas newsletter. As you know I experiment with quite a few pages I create myself, so I always tend to have quite a variety of self printed pages as well. Some don't work as well as I thought, or they have been used and I don't need to carry them any more. I also found some old to-do lists tucked in to my diary that I didn't need to keep carrying. Overall I felt good for sorting out my organisers and then being able to put in the 2010 refills without straining the rings or stretching the closing strap. Now what else can I put in??? We are very privileged here at Philofaxy to be given the chance to sample and review a new product launched today on the Filofax UK website. The marketing team at Filofax UK HQ in Burgess Hill contacted me a few weeks ago asking me if we would be interested in a preview sample of a new product they were about to launch on 1st October and they enclosed the picture below. So I shared the email with Nan and Laurie. I think the instant responses I got back were testament on there own that they both liked the prospect of the seeing such a beautiful organiser, and to also see it on launch day. Anyway, so here is a blokes view point on what is obviously a gift for the ladies... so I have to adopt the Crocodile Dundee persona for this post... it's snakeskin so close! An atomiser pen (screw the lid off and have your perfume to hand all day! I had been sent the snakeskin edition but it is also available in Pink and 'Fresco' Your choice will depend on your own tastes of course. The treatments are only available in UK. But the organiser on it's own is very good value for money if you take in to account the accessories included. or the number of items in your handbag... or dare I even suggest it to go without a hand bag. 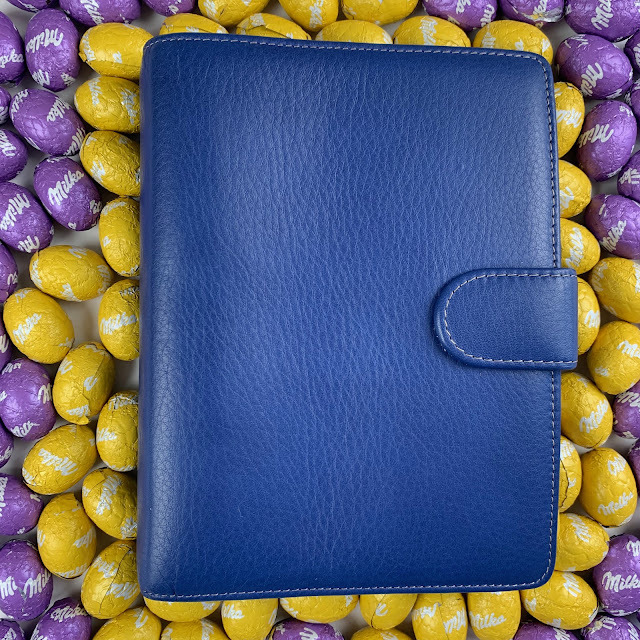 Carry your new Filofax with pride. The timing of the launch of this gift box is obviously aimed at the Christmas gift market, and I think Filofax should be congratulated for the thought they have put in to this gift box idea. The gift box is exclusively available on the Filofax UK on-line store, you will not find it available in any 'brick and mortar' high street shops. Now before you start to think, 'Ah Steve has got his Christmas present for his wife sorted'... we are actually going to give one of our UK readers the opportunity of winning this sample Filofax Beauty Gift Box. Complete with the beauty vouchers and gift box, all as described above. What Filofax would you carry on the red carpet? What's the most recent beauty treatment you scheduled in your Filofax? Open your organiser and look -- no cheating! And one for the chaps: What woman would you most like to give this Giftbox to and why? The three of us will judge the comments and select the winner on October 10th. Naturally we still want to see your comments even if you aren't in UK. We would like to thank Filofax UK for the sample giftbox and for their support. Wow!! I still cannot get over how gorgeous these new Filofaxes are that Steve has exclusively previewed below. I don't necessarily need a new Filo right now, but that snake-look one is really calling to me!! I wish I lived in the UK so I could take advantage of the beauty treatment vouchers! This new offer from Filofax UK makes me realize that the gift season is rapidly approaching, and companies are coming out now with their holiday gift selections. I keep a list in my Filofax all year of gift ideas for each person and occasions during the year, such as birthdays, anniversaries, and holidays. In fact the Filofax Family Organizer has handy monthly pages just for this. That way when I am out and about and think of a gift idea for someone, I can jot it directly onto my list for future reference. Do you already know what you are getting everyone for the holidays this year? Are you one of those organized people who has the gifts all sorted out well in advance, or do you tend to get it together at the last minute? Or, if you can't bear to think about the holidays yet, just let us know what is new in your Filofax life these days!